When I'm traveling overseas I'm not especially engrossed in looking for great beaches; that's because back in Australia we have some of the best beaches in the world. 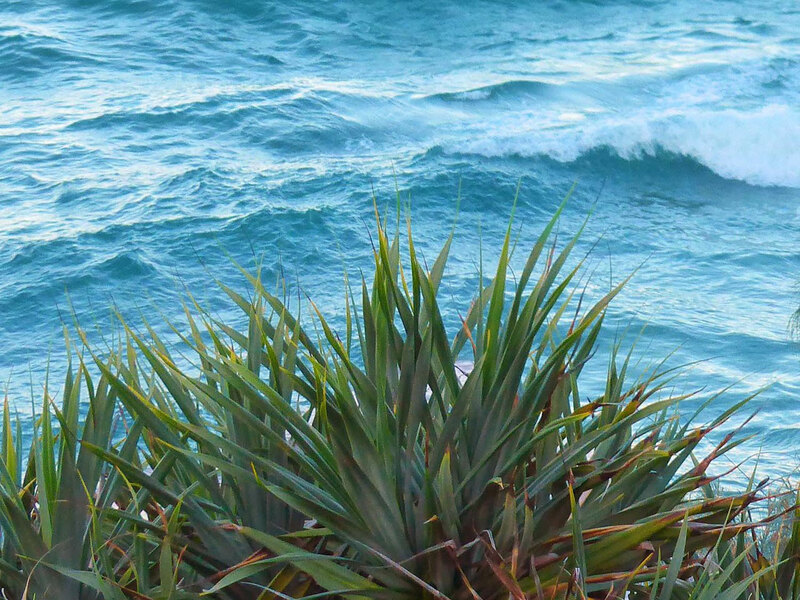 One of my favourites is at Coolum Beach on the Sunshine Coast, Queensland. 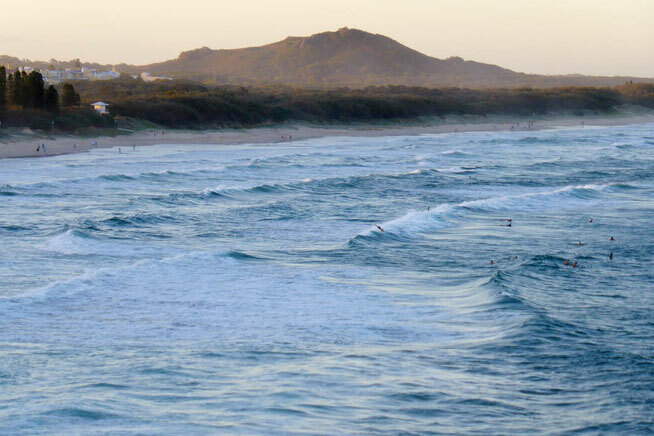 I visited Coolum Beach recently in the early evening of a late-summer day; at this time of day there is usually a beautiful sea breeze blowing in, a lovely soft evening light, and a relaxed atmosphere. 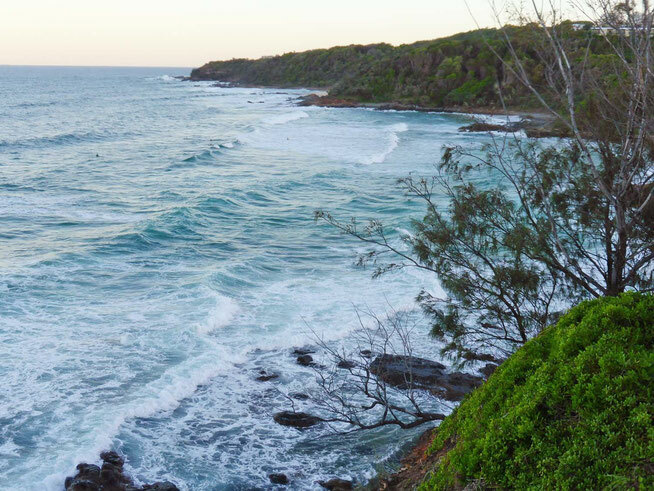 Coolum Beach is at the southern end of a beach that stretches away to the north for an unbroken 15 kilometres of sand, ending at Sunshine Beach and the edge of the Noosa National Park. 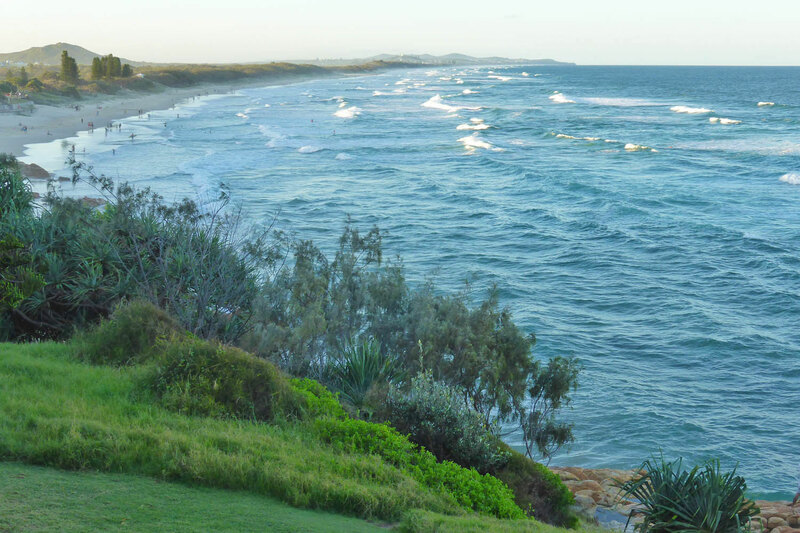 Coolum beach is given a little protection from southerly weather by Point Perry, the headland that it is nestled in against. This is the view from Point Perry of the entire length of the beach; the hills on the distant horizon are Noosa National park at the other end of the beach. Most of this long length of beach feels quite wild, as the dunes are mostly undisturbed and naturally vegetated, and you see very little of the adjacent development when you walk along it. Because of the protection from southerly weather provided by Point Perry, Coolum Beach usually has tidy surf, unlike the fully open beaches, which tends to be messy, a bit disorganised, and with consequently smaller surf. This means that there are usually plenty of surfers here catching the waves. 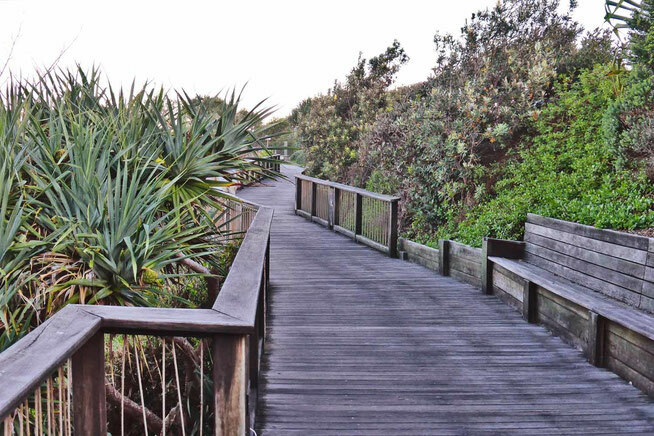 There's a suspended timber boardwalk which runs from Coolum beach up onto the top of Point Perry, with several viewing points that give a great view back along the beach to the north. This is Emu Mountain, a very small mountain just behind the frontal dunes, catching the light of the setting sun, which is also highlighting the foam on the tops of the breaking waves. On the southern side of Point Perry, there are a series of small sandy bays called the Coolum Bays. First Bay is out of sight to the right of this picture, and Second and Third Bays are in the upper middle of the picture, between the rocky headlands. There is a developed walking path along the top of the cliffs over the bays, which gives great views over the bays and the rocks. There are commonly turtles and large rays visible along here. This path and the board walk across point Perry are part of the 96 kilometre long Coastal Walkway, which I described in my post about nearby Marcoola Beach. 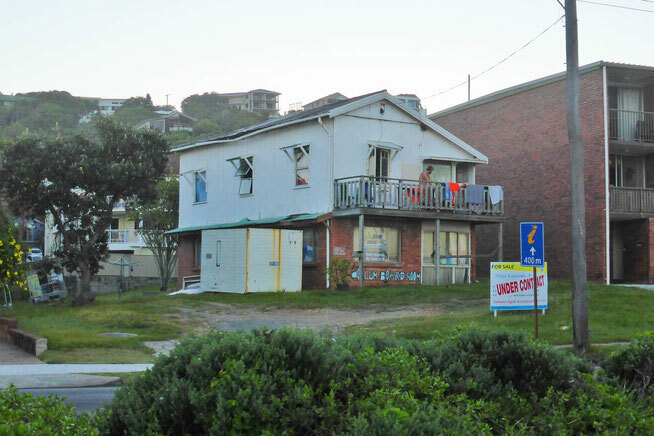 As long as I have known Coolum Beach (a long time – decades), there have been a few remaining tumble-down fibro beach shacks with million-dollar views on Point Perry. These shacks are usually inhabited by young surfers. This is the last one, and going by the sign it's about to go – the end of an era! The Coolum Boardroom – about to go! Coolum Beach is a great place to spend a few days, with lovely beaches and headland walking paths, lots of great eateries at all levels of expense, and a range of accommodation, mostly moderately expensive and up (like anywhere in Australia). 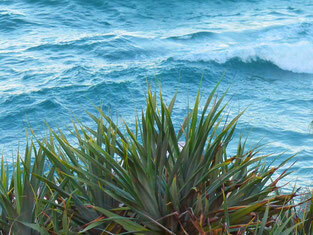 Coolum Beach is not the best beach for poor swimmers as it can get quite rough and is prone to rips. The beach is patrolled by the Surf Life Savers, who pick the safest section of beach and mark it with flags. 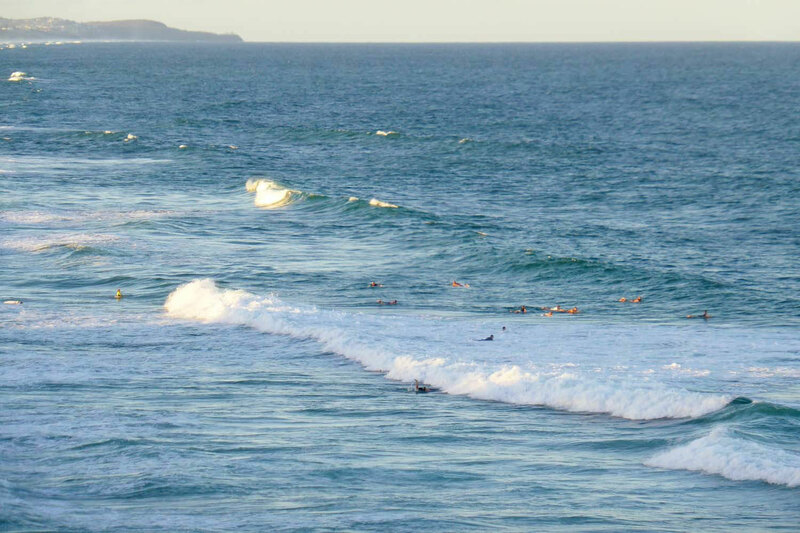 As with any Australian beach, if you are not a competent swimmer who is used to swimming in open-surf-beach condition, swimming between the flags is a good idea, as it will be the safest part of the beach, and the surf life savers will be busting for the opportunity to save you if you get into trouble! Find out about me, Chris, the author of The Journey and the Destination! If you have any questions that you want to ask me use a comments forms on any page, or you can contact me here. Click any picture to expand it.